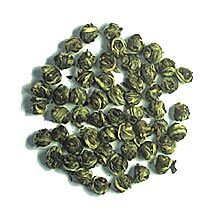 Pearl Jasmine is made by rolling the tender shoots of the tea leaves and buds into beautiful "pearls" and is scented with fresh jasmine petals. This tea is incredibly popular and will delight you whether you are a beginner or the most avid tea drinker. A tranquilizing tea that is light and refreshing, with a delicate jasmine flower scent. The tea leaves are rolled into beautiful pearl-like shape. When steeped, the "pearls" slowly unfurl into long needle shaped leaves releasing its light and wonderful aroma.